Say "Yes, And! ": 2 Little Words That Will Transform Your Career, Organization, and Life! Can saying two little words really make a big difference in your life? Absolutely, if those two words are,"Yes, And." Every new project (or idea, or relationship, or impulse) represents a moment in time. Too often, people talk themselves out of taking advantage of those opportunities by saying, "yes, but" to themselves, to their co-workers, and to themselves. Saying, "yes, but," is a sure way to stay stuck exactly where you are. It's a great way to alienate and annoy the people around you. It's a great way t deny yourself the joy and success you want and deserve. According to professional speaker Avish Parashar, what sets rock stars apart from those who struggle and give up is that the rock stars understand the immense power of saying, "Yes, And." People who succeed first ask themselves, "How can I say, 'Yes, And' to this?" People who struggle don't ask anything; they just say, "yes, but" without thinking. If the idea seems simple, that's because it is. It is also an idea that the majority of the world fails to implement. 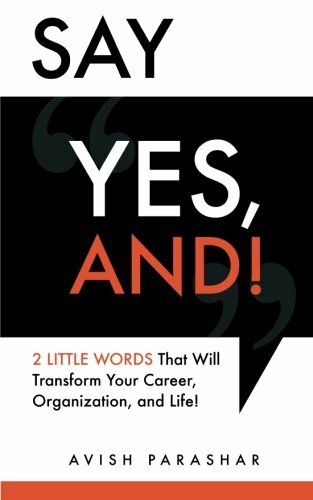 Whether you are a manager of a company, a freelancer, a small business owner, a corporate executive, or simply a person who wants to get more out of their time, relationships, and life, this fun little book will help you figure out where you have been saying, "yes, but," and teach you how to transform your results by switching to "Yes, And." This book doesn't claim to know it all. But it will show you how to find the answers you need by saying two simple words: "Yes, And"